The Samsung Galaxy A7 (2017)is rumored to carry a 5.7-inch Super AMOLED display with a 1080 x 1920 resolution. Powering the device will be the Exynos 7880 for a bit of home cooking. 3GB of RAM is inside with 32GB/64GB of internal storage. The back and front-facing cameras each weigh in at 16MP, and a 3600mAh battery is expected to keep the lights on. Android 6.0 is pre-installed. This morning, word got out that the phone had been recently certified in the U.S. by the FCC. As usual, the FCC site revealed the placement of the agency's label, which will be located at the bottom of the phone. 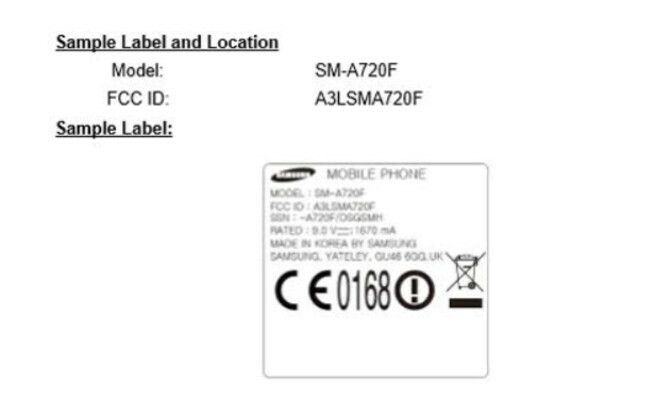 The model number of the phone that visited the U.S. agency is listed as SM-A720F. While not disclosed by the FCC visit, the 2017 Galaxy A series handsets are believed to be the first in the Galaxy A line to feature an IP certification rating. In this case, the IP68 rating that the phones are rumored to have will allow them to be submerged in water as deep as 3.2 feet, for as long as 30-minutes. Earlier today, images of the Samsung Galaxy A5 (2017) leaked revealing what appears to be a speaker located on the side of the device. If that is the case, we probably would see the same design for the Galaxy A7 (2017). While not definitive proof that a side-positioned speaker is coming to the phones, the original YouTube video displaying it on the Galaxy A5 (2017) was taken down. Pricing for the Galaxy A7 (2017) is rumored to be equivalent to $367 USD. While there is no word on when the phone will be unveiled, the FCC visit brings it one step closer to that event. Tap here to load the remaining 1images in this gallery.